Is this young man wearing a slave collar? 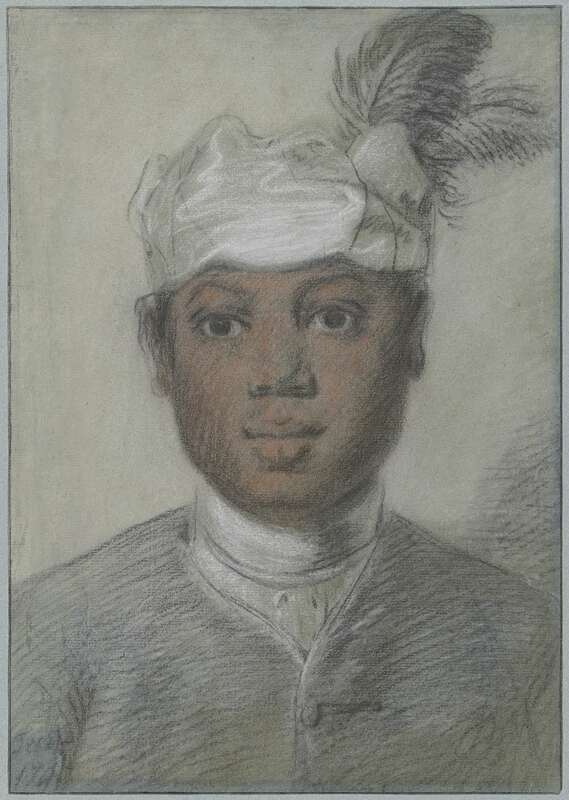 This study by Cornelis Troost undoubtedly shows a black servant or a military musician. His turban betrays his function, for such headgear was exclusively worn by black boys in military or domestic service, and had come into vogue in the late seventeenth century. Until the mid eighteenth century these turbans were often adorned with plumes; later they became simpler. It is not entirely clear whether the boy in the portrait is wearing an equally fashionable slave collar, although this is probable. Cornelis Troost was an exceedingly versatile painter, who acquired great renown with his genre paintings and portraits in oil, gouache and pastel. He was particularly adept at pastel. The present work is an example of Troost’s technique in this medium. He first sketched the drawing and then filled it in with pastel crayon. Troost was also known for his exceptional skill at painting and drawing children, which is evident here as well. He has given his subject his own character: the youth has fine, elegantly raised eyebrows and a hint of a smile that make him look like an adolescent planning some mischief; he also seems to have a slight squint. Troost probably drew the boy as a preliminary study for a later work, yet to be identified. The artist included black boys and men in a number of his works. 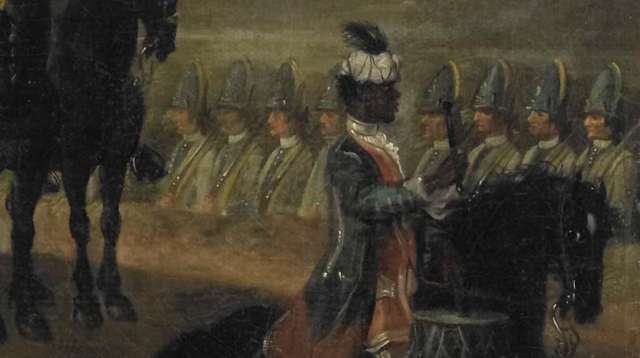 A similar boy appears, for example, as a young black kettledrummer riding in a military parade in Troost’s 1742 painting Inspecting a cavalry unit in the Rijksmuseum Amsterdam. The boys in both works wear exactly the same turban with dark feathers; the boy in the painting definitely has a slave collar around his neck and resembles the boy in the pastel. Although the identity of this boy is unknown at present, he must have been drawn from life. According to Troost’s biographer Van Gool the artist mainly worked on commission. His patrons included a governor of the Dutch East India Company, high-ranking officers in the armed forces, other artists and the future governor of Surinam, Jacob Mauricius 1692 –1768. So he may have seen the boy in one of their circles.